The customer isn’t always right, but a community's consensus likely is. The development of technology in the world of business and finance (forget crypto for a minute) has put clients in a type of co-pilot role. Communication of CEOs and entrepreneurs has shifted from vertical hierarchy to a flat circle in which everyone has a say. This comes with a host of advantages, too. Forgetting how to leverage them, however, could mean that you’re missing out on one of the most important aspects of your blockchain project’s marketing strategy: community building. You can email Mark Zuckerberg from your personal computer. With a bit of Twitter guile, you could easily get some answers to your business’ greatest conundrums from Tony Robbins. Even NBA superstar-turned-entrepreneur Kobe Bryant is relatively accessible. More importantly, all three of these people want to hear from their community. They need that feedback. The power of the Internet, the ability to contact literally anyone in the world at any time of the day, has altered the way we do business. From a marketing perspective, catering to your clientele has been expanded far beyond a two-way conversation. Company chiefs write Medium blog posts, which get commented on by their colleagues, then the target audience chimes in, and soon the linear path from company to platform to audience becomes an amorphous blob of information spread across Telegram channels, Facebook, Twitter, Reddit, and Hacker News. Everyone has access to everyone, and behind a keyboard, few are too intimidated to strike up a conversation. The advantage of this, of course, is that discussions can happen in real-time. The feedback loop for critical questions and answers is incredibly short. Secondly, if powerful enough, a community can help keep a company accountable for deadlines and updates. And, thirdly, giving your users, followers, and fans the opportunity to have a say in your project ties them much closer to your business and increases loyalty. As you can imagine, this also puts a ton of pressure on founders and their employees. In the final addition to our series on crypto marketing, we touched on the importance of transparency with your community. As a rule of thumb, don’t let members come to their own conclusions. Always beat them to the chase. Many of these ideas can easily be applied to any startup in the modern era, not just blockchain hopefuls. A thriving community is incredibly important no matter the venture. There are a few distinctions, however, between a digital community and a crypto community. A thriving crypto community is made up of a broad demographic. There may be venture capitalists in your Telegram groups, speculators asking about an exchange listing on Twitter, and developers could be commenting on GitHub. For a more thorough investigation of the different types of people who you may need to attend to, check out our blog post on the subject. But for the sake of this post, we can pretty much break it down into three different groups: developers, speculators, and users / customers. The end goal is also relatively simple: Get your coin into the hands of as many people as possible and make those holders so exceptionally excited about your project that they tell everyone they know. Sounds simple, right? Building a community like this takes a bricklayer’s patience. Understanding who might be interested in your crypto-related product is one thing, but once those people are all together in Telegram, adjusting to how they interact is a whole different beast. Does the group seem interested in learning more about the technical back-end of the token used on your platform? Or do they want constant feedback on their questions and is that possible for your team? Answering these questions should give you an idea of how nuanced communication has become in the era of crypto technologies. Ideally, your community, even the speculators, will have become so enamored by your team’s vision that they’ll stick around long after the first major exchange listing. The last thing you want is for 75 percent of your community to go silent once you finally earned that coveted Binance ticker. That’s also why you have to build a true followership of loyal fans, instead of solely relying on speculative investors who are just in the game to enrich themselves. A driving thesis for everything you might know about online community management should be striving to convince members that they are building something with you, not for you. The shift from commentator to owner is incredibly powerful and will pay dividends over the long-term. Every community is different and each needs its own set of delicate guidelines. That being said, there are themes that should be considered when building your booming ecosystem. From the get-go, establish whether you have the resources to hire an active manager 24 hours a day. Ideally, there is someone steering the Telegram conversation in all major time zones. The power of the blockchain community is that investors and followers are global. Keep this in mind. If you don’t think you can recruit an ambassador for your Chinese investors, for instance, explain that the discussions will be happening during the daytime hours of wherever you are based. Though not ideal, being honest about how communication will be happening is key. Once people begin piling into and commenting on the handful of different platforms you have dedicated to the project, begin quality control. Spam accounts promoting other products and inappropriate behavior should all be banned immediately. People are there to learn more about the project and its team members, not shill unrelated coins or harass others. So make sure that you do not build a Telegram group which solely consists of speculative investors who do not care about your vision but only about the value of your coin and the date they’ll be able to sell it for a profit. Keeping it professional doesn’t mean that discussions have to be dull either. Try to be as genuine and authentic as possible and speak the language of your target audience. Show some personality and the project’s team members to gain your community’s trust. After you have pinned mission values to a channel, posted a few blog posts with the founders, and announced a handful of partnerships, you can begin exploring other community engagement ideas. Run polls and surveys about content that you’re readers might want to read. One day a week, have a quiz hour in which you test members’ knowledge about Satoshi Nakamoto, monetary policy or your project. Anything that stimulates engagement and ties back into what you are trying to do is all fair game. 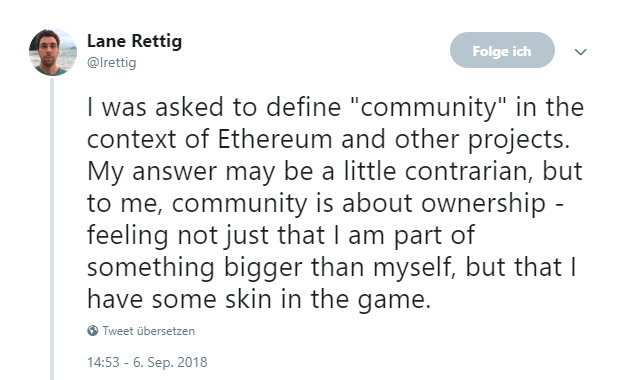 Concluding, the power of your community, especially in the crypto space, is immense. They can take your idea to places never before imagined, or drive it straight into the ground. Attending to all channels where people may be asking questions or commenting is critical for this. And putting excellent individuals to represent you and your ideas is well worth the investment. There’s nothing more powerful than a loyal community that believes in you and your vision. Of course, things won’t be perfect the entire time. But establishing trust via open communication and transparency as well as through genuine contributions means that your community will likely forgive any missteps. Staying vigilant and acting quickly is the key. Communication in the blockchain era moves fast, and you never know who might be reading.